A highly detailed coherent design for a luxury home. The distinct architecture of this luxurious property with a large wrap of garden and mature trees demanded a very high quality of design and attention to detail in the garden to be fitting. With so much glass detailing on the house there were many great views of the garden from lovely interiors that deserved and needed meaningful focal points and features in the garden. Like many large projects this design required a lot of time with the client to evolve a suitable coherent style and choice of materials to relate well to the house. My client wanted easier maintenance with details that always looked great. 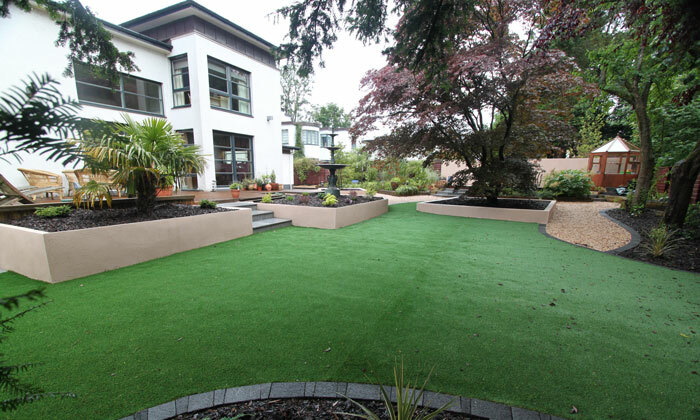 I used artificial grass to great effect on this project creating a soft lush manicured detail even into the shadows. With a feast of details and lines the design offered endless views and focal points around the garden using a restrained palette of materials related to the house to keep a coherent style. With my technical skills and experience I was able to earn the trust of this client and achieve a great result for them with a fabulous lasting garden to suit their fabulous house.